Notes: Inspiration for this came from seeing Alexander Calder’s 1936 work Tightrope at the National Gallery of Victoria. My gallery photos didn’t come out well – better to look on the Calder Foundation website www.calder.org/work/by-category/standing-mobile. Notes: Un-Balance, an infinite series of adjustments, led to Oscillation, a regular periodic fluctuation in value about some mean, nudged a memory of Kepler and the music of spheres, and on to Trepidation, the hypothetical oscillation in the precession of the equinoxes. The mobile took a literal approach. A central “earth” in wood; two arms, each with a “planet” in metal (both copper one side, aluminium the other) circling the earth, each planet balanced with a metal swirl, a swivel allowing the trepidation circle. Without movement, flat and boring. Once a week mum would cook with one of us. Special one on one time, precious among five children. Hand made receipe pages, line drawings of blue open-fingered hands rubbing yellow butter into flour. Notes: Improvising with objects in the serviced apartment when visiting Melbourne for the opening few days of Alexander Calder:Radical Inventor exhibition. Paper cord (made from 2 sheets of A4); books; series of kitchen implements. Apparently it’s now called Freshwater, but when I was a child we would sometimes drive in summer heat to Harbord Beach. A heavy red and white umbrella. Zinc cream. Burning feet trudging through the sand. Staying between the flags, jumping into waves, attempting to body surf. And some days the waves, churning sand, would catch you up, tumble you around, water up your nose, struggling – which way is the surface? And you’d stagger out, legs trembling, eyes stinging, swimmers dragging down from the weight of sand in the pants, hair drying crunchy with salt. Exhausted. Wanting more. So I’m mixing metaphors between title and intro, but that’s just how it is right now and we’ll all just have to make do. Because over the last five weeks I’ve been tumbled, and gobbling, and racing back for more. The blog’s never going to catch up, so a sprint through. Visual focus remains un-balance. Bad reflections in the photo. Lots of flickering movement. A grid rather than balance. Layers, accepting chance, multiple approaches (film, installation, …). Much more time and need for thought and research on Zero and Nul movement(s). Stripes rather than balance. Amazing what clever placement of some nails can do. A wonderful, calming, enriching experience. I chatted for a long time with the two artists, who were incredibly welcoming, forthcoming, encouraging, generous… See more of their project at https://eyesasbigasplates.com/. 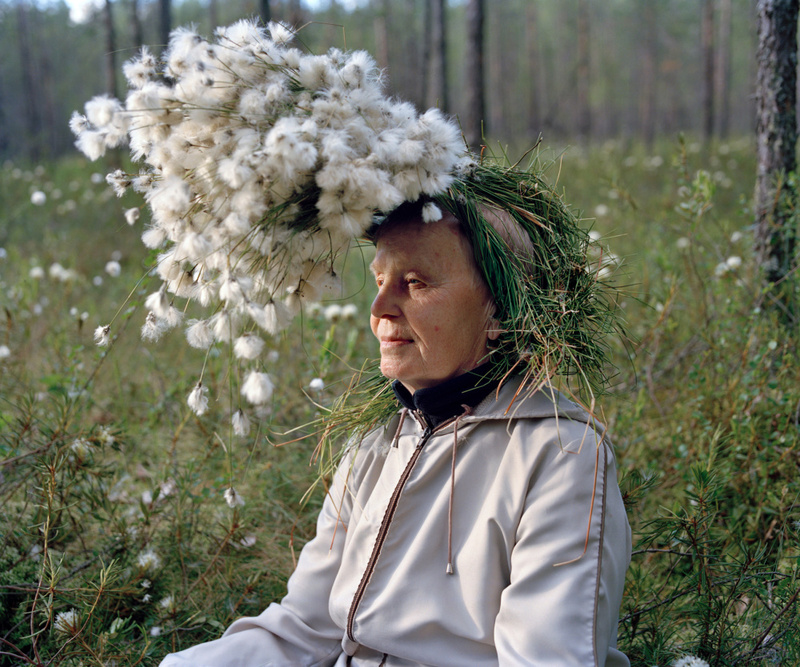 Intensive Creative Research with Ruth Hadlow. The first of our group sessions was held over three days in Hobart. “Intense” doesn’t cover it. Work flowing on from it includes my Energizing Objects and Glossary investigations. I walked the harbourside sculpture trail, but found myself more drawn by views of boatsheds, cottage gardens, inventive weather vanes and tardis side gates. This major survey shows the depth and wide ranging approach of Janet Laurence. Concentric rings of layered and image-printed fabrics combine with light and film to immerse the viewer in trees, within a tree, in the history of our relationship with trees. Modern and ancient knowledge and technologies are brought together. All our senses are engaged. A huge tree, killed by drought, has been pieced together in one of the galleries. It is bandaged, glass tubing suggesting life support, or perhaps an exchange between tree and environment of fluid or air. Engraved markings in the bark, and the insects who made them, are celebrated. Is salt rock a blossoming new growth, or the death of salinity? Eyes on balance, I was impressed by the few supports needed to stabilise the tree in the space. A slight discontinuity in deep fissures in the tree showed the small adjustments made to adapt it to its new life. 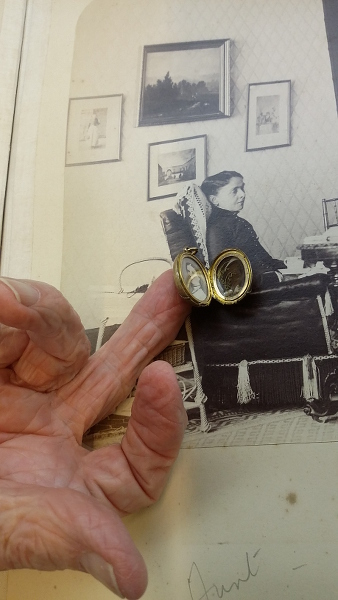 A trip to Canberra with my mother was focused on the photograph albums of a 19th century ancestor – my great great great uncle. The albums were recently donated by a distant English cousin. Mum has researched the Australian period of John Chester’s life, from the 1840s to 1871 – https://megshistory.wordpress.com/john-chester-jervis/. While in Canberra we also visited the National Gallery of Australia, in particular Love & Desire: Pre-Raphaelite Masterpieces from the Tate. There were many familiar works included, but there’s nothing like a bit of parochialism. 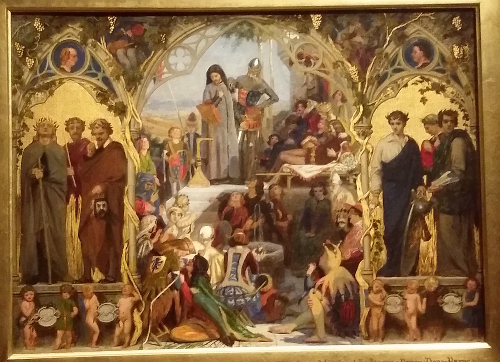 The central section of The seeds and fruits of English poetry by Ford Maddox Brown is a study for an enormous painting, Chaucer at the court of Edward III in the AGNSW collection. It’s one of mum’s absolute favourite works, and whenever we have a few minutes spare at the gallery you’ll find us visiting it. Māori Markings: Tā Moko was fascinating.There has been a contemporary resurgence of this practice, which is of major cultural significance. 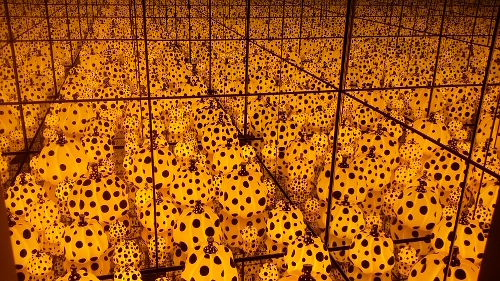 The bright yellow room presented by Yayoi Kusama is billed as an experience of both claustrophobic and infinite space. I’m sure we weren’t the first to find it puzzling. I’ve been vaguely aware of Kusama’s work in the past, and find the obsessive character of it disturbing and in some sense empty. We also found our way down to Bodies of art: Human form from the national collection. There we found Number 24, Harry Boyd, by Harry Klippel. It’s hard to believe this massive piece of sandstone was carved by the same man who made the multitude of inventive wire and tin forms which I most recently saw in Mosman as part of Destination Sydney. (I think they’re actually part of the AGNSW collection). Robert Klippel is definitely one of the artists on my list the research further for un-balance. Part of the interest of un-balance is the constant potential for complete loss of balance – for falling. On the information plaque Hossein Valamanesh is quoted: “Leaving aside narratives the work stands for itself and is about falling with grace.” The long bamboo shivered just slightly in the gallery’s currents of air. The work is beautiful and elegant, but I struggle that it seems to be set at the moment of impact, where grace can no longer hold. The ground is so solid and hard. I’d like to see it Falling on a plinth, white or even perspex, curving to swoop joyfully upwards. No photos, but I’ll briefly mention Hassall Collection at Drill Hall Gallery. No photos – we happened to arrive at the same time as a very large group of people from Canberra and Sydney, and it was hard to get viewing space. 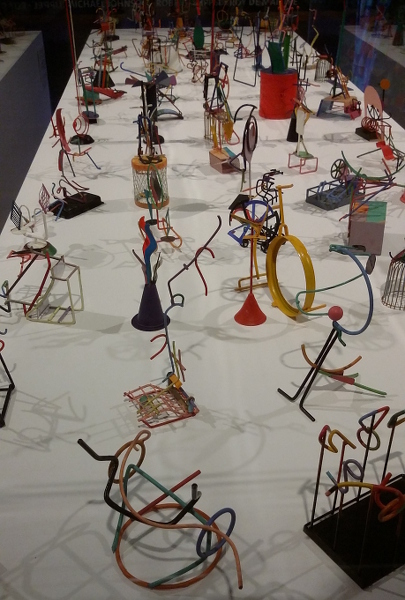 In the last few days I’ve been on another interstate trip – this time to the National Gallery of Victoria, and focused on the opening events of Alexander Calder: Radical Inventor. An amazing experience, needing its own post. While there I took a couple of hours to roam NGV galleries, looking for anything that spoke to me of un-balance. I have no idea what to make of this painting, but I stayed with it for a long time. There are scales. There is a balance achieved in the composition in a way I don’t understand. Research needed. The geometry here is amazing. The roof and tree line, with the path at the bottom, struggle to balance that steep, sliding slope. 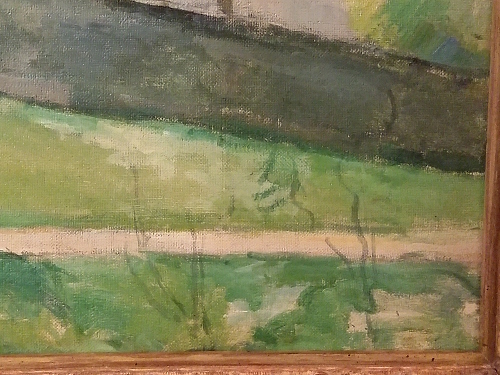 Then in the bottom right corner, and possibly among the last brush strokes on the canvas, is the slightest hint of a straggle of weeds. And I think that braces, props up, the entire thing. Currently hanging next to the Cezanne is The bridge on the Seine at Chatou by Maurice de Vlaminck. Full of energy and zest, and I don’t think the artist cares one whit that the bridge and the entire village on the right bank is about to slide under the waters of the Seine. 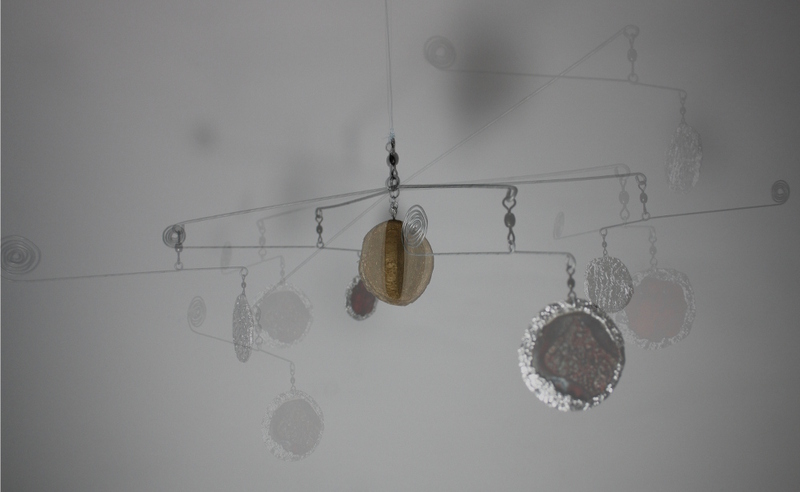 A dreadful photo, lots of reflections and blurry focus, but I want to remember the works of Mari Funaki. A much better photo is on the gallery website here. A beautifully balanced insect of a thing which could leap across the room in an instant. That leftmost leg is wide but thin – the whole thing looks like it could tip backwards, at the same time as it seems perfectly in control. Maybe looking at Funaki’s work I should have been thinking of birds rather than insects. And these lines actually would make a good segue to Alexander Calder and his zoo drawings. But not today. Hassall Collection: A masterpiece Collection of Australian Art. Exhibition catalogue. Alexander Calder: Radical Inventor. Exhibition catalogue. All this added to the metres of unread and part-read books already piled up on the shelves. Five weeks, four capital cities, sixteen books. Good days. Grandma was a proud woman of the north, a Master Cutler in her family line, steel in her veins. Now in the south, we caught a bus into town, eyes straight ahead as we walked past the “loitering youths” (a nervous – making presence, subject of many warnings), to The Bon, the big store. Scissors. We searched. We asked. No Sheffield steel. None. I’d never seen Grandma so upset, almost arguing. How is this possible? No Sheffield steel in your store! Walking back, I had never seen her so tired. Sad. Lost. 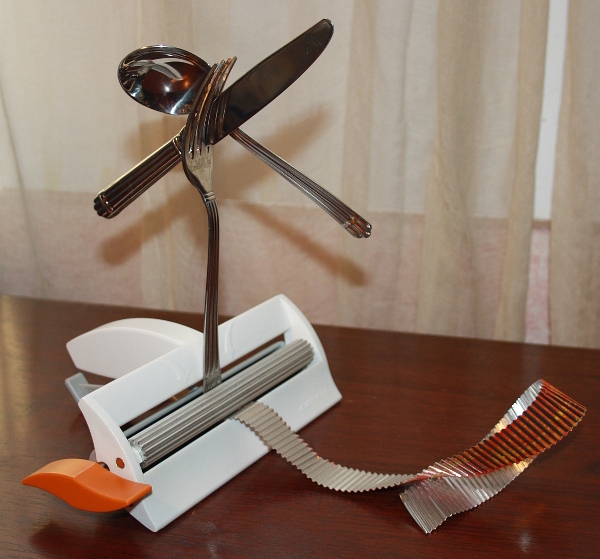 Notes: Cutlery, corrugating tool, aluminium strip. A chance combination of items on the worktable. There was a question around the grandfather and his preference for a three-legged stool. Not my grandpa. A generic grandfather, the sort who gets caught up in a question on a school maths test. My early energising repeats the lesson. Notes: Weaving shuttle, chopsticks and kitchen scourer. There was a series of simplifications, concluding in a simple and stable tripod.